. . . burped loudly and apologised. The Chairman asked whether we were quorate. "Ah Begorrah, there be two turds 'ere to be sure", he said which the Minutes Secretary took to mean that the required two-thirds were present in some way or another, probably mostly in spirit. "So when should we have the next Paddock Party?" asked the Minutes Secretary. "Ah! Good question!" boomed the Chairman, not because he was particularly fond of booming but he was standing in one doorway and the Minutes Secretary was standing in another. Between them was a great deal of wind and rain and assorted other weather so booming aided communication. "Sometime in August?" suggested the Minutes Secretary, hoping that the Chairman wouldn't ask what dates the Saturdays fell on. "What dates do the Saturdays fall on?" boomed the Chairman. "Dunno." was the reply from across the great gravel divide. "Pardon?" said the Minutes Secretary. "Oh, er. . . use less celery - add dozen or so plates of battered crayfish here!" re-boomed the Chairman. "I was reading a recipe to, er, Bruno or someone . . . sorry . . . right. So that's agreed, then!?" 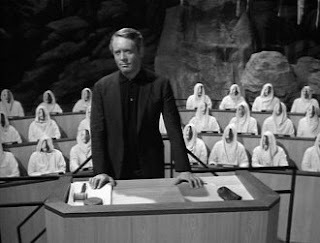 Attributing as I do much of the more unfathomable nature of my character to the influence in the 1960s of Patrick McGoohan's character in Danger Man and The Prisoner, his passing deserves mention here. The name of this site and the many obscure references I make elsewhere reflect my fascination with not just the characters he portrayed but also his own intelligence, attitude to those who thought they had power over him and dry interpretation of events that shaped his own life. He will always remain both Number 6 and a Number 1 fellow in my book. Took this when I got home Monday. Note that my only visitor throughout the whole day had been a four-legged one. Bruno lives behind the white door and appears to have made one trip hoping to have a chance to hoover up whatever ingredients I'd left on the kitchen floor but had to return empty-pawed. Maggie's twiglets and Graeme's frosties are much better than what I used to get on the other side of the fence. I was almost relieved to discover that the mystery traveller hadn't forgotten me. Along with my first post of 2009 comes this envelope, bearing the usual heavy type label and quite an old 2nd class stamp that must have been lying around for a while as the variety with the big fat 2 was dropped from sale ages ago. The dear sender may have to apologise for breaking the sorting office machine as it looks like the contents got jammed in some works somewhere with most of the usual postmark identifiers at a weird angle and it's surprising the comb got through at all. Anyway, at last I do seem to have something by way of a clue as KrasAir went out of business in late 2008 and also didn't exactly have hundreds of destinations. In fact, outside Russia, the airports used were few but did include Austria, Germany, Greece and Portugal so I'm looking for someone who has either been behind the Iron Curtain (which would whittle it down to one pretty unlikely person) or one of the other places. It really isn't the sort of airline you pick up from UK so someone has presumably made an internal flight and done so before they went bust. Luckily. Or they bought some KrasAir combs on Ebay. More when I think about who's been where recently. I love this. If whoever it is reads this and permits themselves a smug smile then it is thoroughly deserved. Happy new year unless you're a manic stalker and the envelope contains polonium. Oops that'll get spotted by the internet traffic observation boys. Oh well. Another chapter for the book, maybe. I suppose I should translate the previous post. Just use the keys to the left of those I typed and you'll get the message. And Happy New Year, readers and those of you who drop in because you searched for something completely different and, hey, guess what, landed on something completely different indeed! I had a number of requests to minute proceedings when members of the Paddock Party Committee saw the MMVIII turn into an MMIX on their grandfather clocks. This I can do quite simply as there was absolutely nothing to report that is in any way associated with what will be Paddock Party Number Six. Quite how this could have occurred I am not entirely clear but it may have something to do with the comparatively large amount of wine and champagne consumed and an immense amount of food. However, all previous committee meetings have had similar accompaniment so the absence of Paddock Affairs is odd but has saved me considerable work. Rather pleasantly, no New Year Resolutions were declared either. You know, the ones that either get broken within a matter of weeks or were suitably vaguely worded as to be reasonably easy to get out of anyway. I mused whether to ring or wait to be rung. So much to do. So little time. The first thing we did in 2009 was to play consequences, rather badly. One or two people made a valiant effort to contribute in some style so that the he said-she said etc. produced something worth reading but most were pretty painful and I'm sure it was better when I was 14. 2008 was a good year in many ways and with some great memories, firsts and what I think could be key developments. It ended pretty strangely, though, to say the least, which, of course it did.